Pursuant to 36 CFR § 261.50 (a) and (b), the following act is prohibited on all lands as described in this order, within the Mountain Home Ranger District, Boise National Forest. This Order will be in effect when signed and shall remain in effect until further notice. 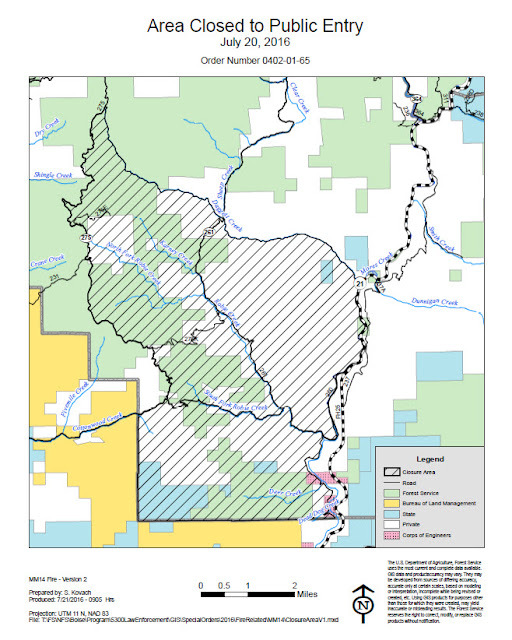 The MM14 Highway 21 Fire Closure Area is described as all National Forest System (NFS) lands (including all roads and trails within the area) within the following boundary - beginning at the confluence of Daggett Creek and Mores Creek located in Township 4 North, Range 4 East, Section 16; continuing northwesterly along Daggett Creek to NFS Road #275 located in Township 5 North, Range 3 East, Section 34; continuing southerly along, and including, NFS Road #275 to County Road #260 (Rocky Canyon Road) located in Township 4 North, Range 3 East, Section 35; continuing westerly approximately ½ mile along, but not including, County Road #260 to the Boise National Forest boundary located on the western edge of Section 35, Township 4 North, Range 3 East; continuing south, then east along the Boise National Forest boundary to the western edge of Lucky Peak Reservoir located on the southern edge of Section 9, Township 3 North, Range 4 East; continuing northerly along Lucky Peak Reservoir, becoming Mores Creek back to the point of origin. 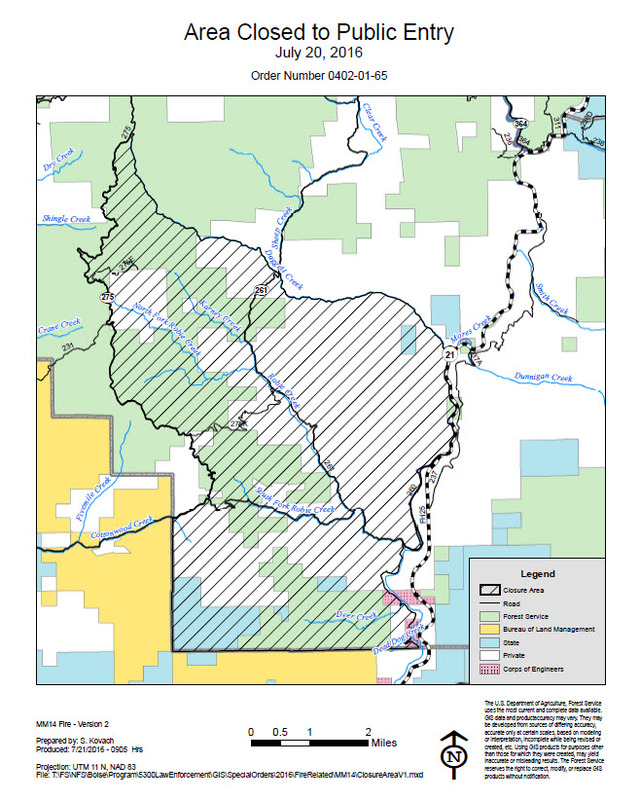 The above described Area (including all roads and trails within the Area) are located on National Forest System lands within the administrative and proclaimed boundaries of the Mountain Home Ranger District, Boise National Forest, Boise and Ada Counties, Idaho, Boise Meridian. The area as described above has ongoing wildfire activity (MM14 Highway 21 Fire). This area is closed for public safety and protection from hazards associated with wildfire. 1. This Order will be in effect when signed and shall remain in effect until further notice. 2. A map identifying the closure area is attached and made part of this Order. 4. Violation of the above prohibition is punishable by a fine of not more than $5,000.00 for an individual, or $10,000.00 for an organization, and/or imprisonment for not more than six (6) months. 16 U.S.C. §551; 18 U.S.C. §§ 3571(b)(6), 3581 (b)(7). 5. This Order supersedes any previous Order(s) prohibiting the same, or similar acts prohibited by this Order in the areas (and/or roads, trails) covered by this Order. 6. Further information regarding this Order may be obtained at the Mountain Home Ranger District located in Mountain Home, ID, telephone number (208) 587-7961, and at the Boise National Forest Supervisor’s Office in Boise, ID, telephone number (208)-373-4100. Done at Boise, Idaho this 20th day of July, 2016.